SEOUL, South Korea, March 23, 2017 /PRNewswire/ -- LinearHub (CEO: Sunghyuk Kim) will be participating in Enterprise Connect 2017, the largest enterprise communications trade show in the US, to be held this year in Orlando, Florida from March 27 to 29 (local time). Enterprise Connect 2017 is the largest corporate communications trade show in North America. Participants of this year's trade show include global enterprise communications companies such as Microsoft, Cisco, Avaya, and Polycom as well as other companies in the unified communications and IP telephony fields. LinearHub is a startup company known for its development of Roundee (roundee.io), a video conferencing service for Slack (corporate collaboration platform) users. At Enterprise Connect 2017, LinearHub will be showcasing its solution under the theme titled "The Importance of Records (originally titled "The palest ink is better than the best memory. ")", which will spotlight an upgraded version of Roundee, complete with several enhanced functions, such as simultaneous editing of minutes, meeting videos, and transcripts. The "Minutes" function of Roundee enables real-time editing and write-ups of meeting content while the meeting/video conference is actually taking place, which not only saves time by eliminating the need to write up a meeting's minutes post meeting, but also helps improve corporate communication for quicker and more efficient decision-making. The "Meeting Video" and "Transcript" functions help users conveniently share, save, and search video conference content after meetings -- this allows video conferencing to not only serve as a real-time communications tool but also a knowledge-based tool. LinearHub's Roundee focuses heavily on the provision of comprehensive services and has already begun to carve out a solid niche for LinearHub in the intensely competitive unified communications market. The service's "Minutes" and "Transcript" functions, in particular, are not offered by other companies and help users achieve a level of meeting productivity and efficiency that cannot yet be attained through other video conferencing services. Roundee seeks to attract buyers and companies that are looking for the optimum team communication solution. LinearHub is a member company of the K-ICT Born2Global Centre and an incubation company of the Gyeonggi Center for Creative Economy & Innovation and Korea Telecommunications Operators Association. Since its inception, the company has been selected as a K-Global 300 company by the Ministry of Science, ICT, and Future Planning (2015) and has been named a "Red Herring Global Top 100 Technology Venture Company" (November 2016) by Red Herring, a global IT magazine that has selected the top 100 most promising Asian, North American, and European companies in various fields each year since 1996. From among 1,000 companies in 40 countries around the world, the 2016 Red Herring Global Top 100 Technology Venture Company award was granted to startups who have introduced the most innovative technologies and business models this year. This year at Enterprise Connect 2017, LinearHub, which continues to be recognized in the international arena for its growth potential, will stand alongside foreign conglomerates as it proudly demonstrates its advanced technology. LinearHub CEO Kim Sunghyuk is also one of the founders of Serome Technology, one of the first companies in South Korea to feature diverse Internet-based communications technology (Internet phones, etc. ), and Nable Communications, a company that has been listed on the KOSDAQ since 2012. LinearHub CEO Kim commented on the company's upcoming participation in Enterprise Connect 2017, saying, "We hope to introduce Roundee to a diverse range of potential clients at this year's event and will be making use of diverse channels to introduce Roundee to markets throughout the world." For more detailed information on the LinearHub, please check out https://roundee.io/. LinearHub is a startup company known for its development of Roundee (roundee.io), a video conferencing service for Slack (corporate collaboration platform) users. At Enterprise Connect 2017, LinearHub will be showcasing its solution under the theme titled \"The Importance of Records (originally titled \"The palest ink is better than the best memory.\")\", which will spotlight an upgraded version of Roundee, complete with several enhanced functions, such as simultaneous editing of minutes, meeting videos, and transcripts. The \"Minutes\" function of Roundee enables real-time editing and write-ups of meeting content while the meeting/video conference is actually taking place, which not only saves time by eliminating the need to write up a meeting's minutes post meeting, but also helps improve corporate communication for quicker and more efficient decision-making. 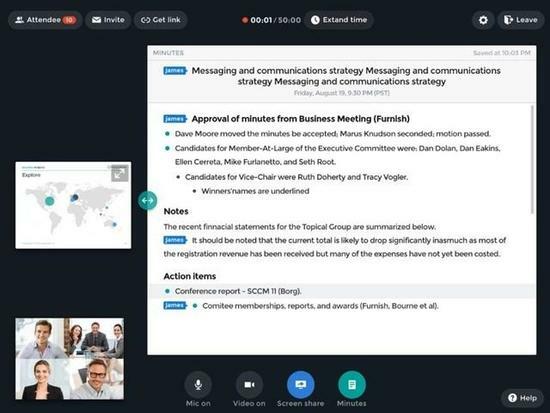 The \"Meeting Video\" and \"Transcript\" functions help users conveniently share, save, and search video conference content after meetings -- this allows video conferencing to not only serve as a real-time communications tool but also a knowledge-based tool. LinearHub's Roundee focuses heavily on the provision of comprehensive services and has already begun to carve out a solid niche for LinearHub in the intensely competitive unified communications market. The service's \"Minutes\" and \"Transcript\" functions, in particular, are not offered by other companies and help users achieve a level of meeting productivity and efficiency that cannot yet be attained through other video conferencing services. Roundee seeks to attract buyers and companies that are looking for the optimum team communication solution. LinearHub is a member company of the K-ICT Born2Global Centre and an incubation company of the Gyeonggi Center for Creative Economy & Innovation and Korea Telecommunications Operators Association. Since its inception, the company has been selected as a K-Global 300 company by the Ministry of Science, ICT, and Future Planning (2015) and has been named a \"Red Herring Global Top 100 Technology Venture Company\" (November 2016) by Red Herring, a global IT magazine that has selected the top 100 most promising Asian, North American, and European companies in various fields each year since 1996. From among 1,000 companies in 40 countries around the world, the 2016 Red Herring Global Top 100 Technology Venture Company award was granted to startups who have introduced the most innovative technologies and business models this year. LinearHub CEO Kim commented on the company's upcoming participation in Enterprise Connect 2017, saying, \"We hope to introduce Roundee to a diverse range of potential clients at this year's event and will be making use of diverse channels to introduce Roundee to markets throughout the world.\"